The Lightwire Theater performs visually stunning plays that will interest children and adults alike. Photo credits courtesy of Lightwire Theater, used with permission. In order to have maximum impact, children’s theater should be based around a good story that is presented magically and visually stunning and the performances from the Lightwire Theater Company fits that bill. The story is inspiring and funny. Marvin the mouse wants to be popular. Constantly bullied and picked on by the "cool" rats, he is labeled as a loser and a geek. As respite from the continuous badgering, he retreats into his science books and a world of fantasy. He longs to have adventures and to be the hero. On a trip to the surface of the moon via a homemade rocket, Marvin meets a strange cast of misfit creatures and learns of infinite peril and awesome beauty. Will Marvin make his dreams come true and bring him the glory and acceptance he craves. AXS: What inspired you to start the Lightwire Theater and why was that specific name chosen? Ian Carney (I.C. ): Originally, our company was named Corbin Visual Arts and Dance. My wife, Eleanor Carney and I were both born and raised in New Orleans and met as teenagers in ballet class. Our dancing careers took us to New York, and it was on Broadway when I met Corbin Popp, while dancing in Twyla Tharp’s "Movin’ Out." We discovered our mutual love of art, theater and technology. 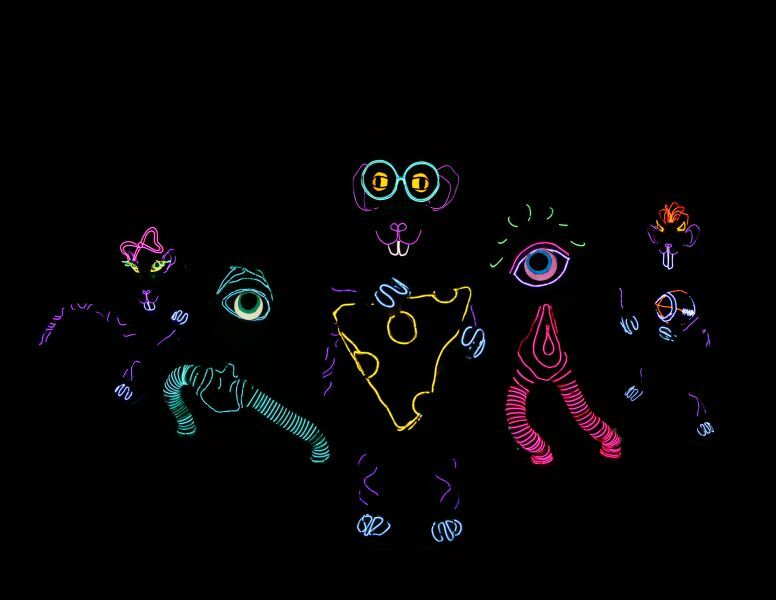 Together with our wives, Corbin and I began to experiment with shapes and designs to develop puppetry-based neon creatures that quickly came to life. Our first production was "Dino-Light." Once we got the opportunity to appear on TV's America's Got Talent, we looked for a more descriptive name that would be easier for people to understand. Lightwire Theater seemed to be a good way to brand it. AXS: What kind of plays does the Lightwire Theater favor and how do you acquire your plays? I.C. : When I was young, my father and I liked to watch sports on TV. We always wondered, "who's not supposed to win?" and then we rooted for them. Our productions are all underdog stories, about characters that are able to achieve more than what people expect of them. Everyone loves an underdog, and you can do things with non-human characters that are not possible with actors. Our shows are almost entirely wordless, so that the stories are told through movement, light and music. People all over the world are able to enjoy them. AXS: So far, how many plays have you produced? I.C. : We present five shows currently, and they're all aimed at all ages. Our two two-act shows are "Lightwire: The Show," and "A Very Electric Christmas." Our three one-act shows (for younger audiences) include "Dino-Light," "Ugly Duckling & Tortoise and the Hare," and "Moon Mouse: A Space Odyssey" which will be presented at Symphony Space as part of the Just Kidding season on Saturday, March 19th. AXS: Of all the performed pieces, do you have a favorite? If so, which one and why? I.C. : Each of our shows holds a special place in my heart. Each one says something different. We go through great pains to create shows that are for all humans to enjoy; they're not just for kids. So often, children's theater is aimed only at children, and the parents are bringing them to the show. In America, we tend to assume kids don't understand a whole lot; we underestimate their ability to stretch. Our shows offer a little more than what is exactly right in front of you. In the case of "Moon Mouse," of course the parents will get the Elton John references when Marvin the Mouse dons big star glasses. Kids will love it, and adults will have a great time, too. They're discussion starters. AXS: How did you come up with the idea for "Moon Mouse"? Can you tell us a little more about the production? I.C. : The show has many positive messages for children, and it deals with the issue of bullying. It came from personal experience. As a kid I was made fun of for taking ballet class. I understood what it felt like to be an outsider and not part of the group. I actually quit dance because of peer pressure when I was 14 and got involved in sports. Years later in college I went back to dance - and was very fortunate to go on to have a long and successful career as a ballet dancer. We hope that Marvin will encourage everyone to embrace being different and not be afraid to walk to the beat of their own drum. I.C. : It's always beautiful to see the moment when a child's face lights up at our production. We hope that is the moment when they realize for themselves that art is important, and that it has to be a part of their lives. Everyone in theater can recall a moment like that. It's rewarding to move people, and to see people sharing something together. This human experience is unique to theater. You can never replace the experience with a video game or a smart phone. AXS: Where do you hope Lightwire Theater will be in ten years? I.C. : We're going to spend our third summer in China this year, and we've been to Europe and South America as well as all around North America with our shows. We want to continue reaching as many people as possible. Since we come from the world of dance, we know how this kind of physical theater can reach beyond language. I.C. : The best advice I can give is to notice everything around you. When there's down time backstage, look around and find out what everyone's doing. Don't just focus on yourself and your own personal goals; notice the totality of what it takes to put on a production. Earn every stripe you get, and learn something from everyone you meet. To learn more about the Lightwire Theater visit their official website. To find out most about “Moon Mouse” at Symphony Space in NYC, see here.